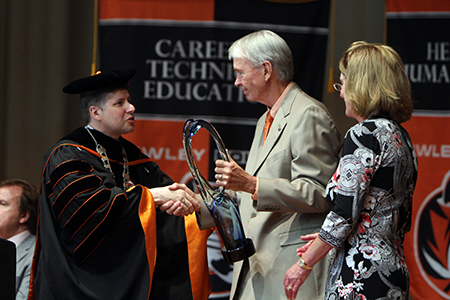 He is thankful for the opportunity afforded him through his higher education starting with Cowley College. She booked several speakers at the college and main-stage cultural arts performances, and worked with different artists to design the college Christmas Card. She also served on several college committees including Administrative Council, Strategic Planning Committee, Marketing Committee, and Cultural Arts Committee. Over the years she has been a member of the Rotary Club, serving as past president, the Walnut Valley Beautification Committee, South Central Kansas Regional Medical Center Foundation Committee, Southwestern College Board of Trustees, Legacy Foundation, Arkansas City Community Theatre, Ark City Arts Council, Arkansas City Children’s Theatre, and the Power of the Purse Foundation. She has also served on several committees at First Presbyterian Church.